To properly look at and talk about the future, it is important to look back at the past. If you are an educator using social media for your own professional learning, or if you are leading professional learning around any current issues, it is important to know a bit of history and to recognise that you are moving along a path that has been forged by others before you. I haven't always been so quick to recognise that myself in the past - and I see some of my own naivety and self importance from a decade ago manifesting itself in others in the present day. I will try to provide an example. I first joined my local edtech professional association back in 2005, being encouraged by a mentor from the Technology School Of The Future named Yvonne Murtagh. It was through one of her workshops that I became really interested in the potential of Web 2.0 (as it was called back then) and I embraced the concept of blogging for professional learning. The association was CEGSA (known now as EdTechSA) and through various channels I met a high school teacher named Bill Kerr. Bill was working in the area of computer science and digital game making (amongst other things) with his students, and was an advocate of programming well before the recent push that sees coding as an important skill that students need. I am sure that he would view the latest push from experts with a wry smile and just a little frustration that so few educators (myself included) could see the value of this work eight years ago. Bill ran some great presentations at the annual conference where he would buck the trend of what was being offered, and showcase some interesting things. 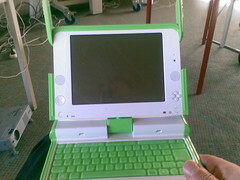 One year, he managed to get his hands on a OLPC laptop - and another time, he gave a talk about Alan Kay, a contemporary of Seymour Papert that seems even more relevant in today's STEM and Makerspace frenzied edusphere. Gary Stager has also worked in this space for many years, working with the acclaimed David Loader in Melbourne back in the early nineties on a pioneering one to one laptop program. He has been and is still a leading advocate of the maker movement for learning. I have had the privilege of seeing Gary on several occasions and he always challenges my thinking because he can take what is accepted as good practice in the wider education community and turn it on its head. He also must be frustrated and relieved in equal parts that his message and work over such a long time is now gaining mainstream acceptance. But education and schools are slow moving beasts - so slow that messages and ideas that seem new are often reincarnations from the past. But the latest generations promoting edtech quite often think they are the pioneers and the innovators when in fact, with a little bit of digital literacy, they can find that they are the benefactors of less heralded but more important work and thinkers from the not so distant past. Like I wrote earlier, I too have suffered from the delusion that I was travelling a new path that the majority of educators had to eventually get on board with. But being an early twitter user or maintaining a blog for over a decade or doing interesting things in the classroom doesn't qualify me for anything but being a learner who can still learn from others and share a few things along the way with others. Bill critiqued the read/write web I was in love with back in 2007, and at the time, I felt offended and a bit misunderstood. So I am sure that some more recent voices on Twitter and other online spaces would likely be unresponsive to my plea to "know your history" a bit more before you put yourself up on a pedestal as a progressive educator or a changemaker. But if you are pushing makerspaces and don't know who Gary Stager is, you need to look back. If you think you are being cutting edge with games and have never heard of Marc Prensky, do a bit of homework. And if you think you're cool because you're a self professed connectivist or have a PLN, but have never read Stephen Downes, George Siemens, Nancy White or Leigh Blackall, then get in touch with the recent past. I'm not bothering to link those names because Google will lead you down as many relevant rabbitholes as you can handle. Don't be like George Bush when he said, "The past is over." Posted in Future Directions, Learning, Personal Reflections on April 11, 2016 by Graham.